She is the protagonist of Akuma to Dolce. Being the daughter of a demon-summoner, she also possesses the gift to summon. In the story, her parents are abroad, so she lives alone. However, she uses her gifts to help with everyday normal tasks, in exchange for giving small treats to the familiar that assists her. She also is an amazing baker, which adds to her reputation among the lesser demons, though she normally only summons "Chibi-chan". She one day accidently summons the high-level and aristocratic demon Belze to remove a stain on her skirt. Seeing what she had to offer (a small piece of candy), Belze is enraged and is about to kill her when he catches a wift of the tarts she baked earlier. Obviously having a fetish with sweets, Mayuri offers the tarts to Belze and from that moment on, their relationship grew. Belze gave Mayuri his personal summoning circle so that she could call on him whenever she had sweets - in exchange for small things, of course. Somewhere along the long, we are introduced to a female demon that claims to be Belze's fiance. 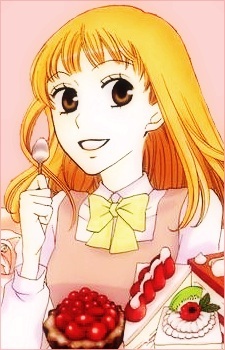 She was jealous of Mayuri's skills at baking that captured Belze so easily, and persuaded to be taught how to bake. After Mayuri aided in helping the female demon bake the cake, she was exposed to a poison for humans. She then stole Mayuri's form and went to give Belze the treats she had made. Seeing how nicely Belze treated "Mayuri", the female demon was outraged. She soon left. Belze went looking for her and soon discovered the dying Mayuri. Mayuri was ultimately cured, thanks to Belze's order to make a cure from the female demon. During her life-death situation, Mayuri had a nightmare that had repeated previously on other nights. There, however, she sees Belze and realizes her feelings for him. After waking up, she immediately looks for him. Seeing him hide behind the trees outside of her house, she tackles him, only to reveal that he was crying. Her feelings for him blossomed even more.